Way back at the end of 2015 there were some updates to the FODMAP content in a range of alternative milks available to purchase including soya, coconut, almond, hemp, oat and rice milks. Just before I left the King’s College London FODMAP research team we sent a batch of UK alternative milks to Monash University to test for FODMAP content, the results of which have been updated on their low FODMAP app. This update has left many people asking about soya milk and its suitability on the low FODMAP diet. Isn’t all soy milk low FODMAP? Soya milk is made from either soya beans or from soya protein – this is important because they both contain different amounts of FODMAPs. In the UK previously (2011-2015) soya milk was allowed on the low FODMAP restriction diet but the recent analyses by Monash shows soya milk made from soya beans / hulled soya beans do contain FODMAPs in the form of galacto-oligosaccharides (GOS). The image below indicates that 15% of the soya bean contains soluble carbohydrates with the GOS ones being in the forms of stachyose and raffinose. Soya protien on the other hand is low in FODMAPs and soya milks made from soya protein are suitable on the low FODMAP restriction diet. As you can see in the image below about 38% of a soya bean is made up of protein. At the moment all soya milks available in the UK are made from soya beans unfortunately. If you are a lover of soy milk and live in the UK there is some good news however. The FODMAP content analysis of soy milk (made from soy bean) indicated that a maximum portion size of 60mls can be classed as low in FODMAPs while 120mls is moderate in FODMAPs (GOS). 60mls is not much of course but certainly enough for use in tea or coffee. You could also mix that 60mls with an alternative low FODMAP milk such as hemp or almond milk to use a larger volume on cereals for example. Otherwise you could have 120mls soy milk as part of a low FODMAP diet but make sure you keep any other moderate FODMAP foods to a minimum on the same day you have the 120mls soy milk. An important note is this low FODMAP serving of 60mls is for UK soy milks and 60mls may not be low FODMAP in soy milks purchased in other countries. For example in the Monash low FODMAP app they show a low FODMAP portion size of soy milk as 45mls in soy milk from Austria while other soy milks analysed do not have a lower portion size recommendation. If you do manage to find soy milks made from soy protein however you can consume 250mls which is still classed as low FODMAP. Finally there is one more thing to look out for in soy milks; and that is any added high FODMAP ingredients. Commonly here in the UK if you buy a ‘sweetened’ soy milk then fruit concentrate, apple juice or fructose ingredients are often used as the sweetening agent. This introduces fructose into the soy milk and analyses by Monash has discovered that ‘sweetened’ soy milks from the UK contain high amounts of fructose as well as GOS at 250mls. Very interestingly these ‘sweetened’ soy milks also contain moderate amounts of fructans and GOS at 60mls. Remember that the unsweetened versions were completely low FODMAP at 60mls. So what is the difference? Another commonly used high FODMAP ingredient called inulin (a type of fructan) is often added to ‘sweetened’ soy milks and it is this inulin that increases the content of fructans and GOS found at 60mls and at higher portion sizes. It is worth saying that people have been doing the low FODMAP diet in the UK for several years while consuming soya milks (made from soya beans) as part of the low FODMAP restriction diet. The majority have still obtained a reduction in their IBS symptoms. However there were always a minority of people that felt soya milk was a problem and now this recent analysis shows this was probably due to the GOS content. But what if I want to consume soy milk on the low FODMAP restriction diet as I don’t like the other alternative milk products? The choice is yours and I would suggest that if consuming soy milk or yoghurt products will make the low FODMAP diet more acceptable and help ensure nutritional adequacy then this is what you should do. Remember the diet is not a ‘FODMAP free’ diet but aims to restrict your overall intake of FODMAPs which hopefully will reduce your symptoms – just ensure you are strict with everything else. As mentioned above people have consumed these foods in the past and still seen a reduction in their symptoms. What about other soy products, are they low FODMAP? Regarding other soya bean based products such as soya yoghurt or ice cream, they have not been analysed by Monash. Probably like the soya milk it may be that a smaller portion size is low FODMAP but higher amount become high in FODMAPs. Most recently Monash recently analysed soy cheese which was found to be low FODMAP at 40 grams. Additionally textured soy protein is high in FODMAPs (fructans and GOS) even at 1 tablespoon (15g). Soy sauce by the way is low FODMAP and has been analysed up to 2 tablespoons (42 grams) as low FODMAP. Soy and the products made from it, such as tofu, are confusing food items in terms of FODMAP content. Patsy Catos has written a very useful short article on why soy is confusing which can be found here. For example we know soy beans are high in FODMAPs (easy to see why by looking at the composition of a soybean in the image above) but tofu which is made from soy beans is low FODMAP. This is because fructans and GOS are water soluble and during the processing of tofu the FODMAPs are basically squeezed out of the block of tofu and into the surrounding water used during the processing. Other soy products and ingredients e.g. soybean lecithin, and there appropriateness on a low FODMAP diet are also discussed in Patsy’s article FODMAPs and Soy: Why so Confusing? If you are still confused after that then you can also take a look at this article which provides a summary about Soy & the Low FODMAP Diet. Want more information on the low FODMAP diet and IBS? Click here for the latest changes and important updates. Low FODMAP recipes here. Thank you for clarifying this question which I’d been wondering about. I’m reflecting on nearly 2 years following (with pretty good overall effect on symptoms) a low FODMAP diet, including Alpro soya unsweetened ‘milk’ on my morning cereal and in cups of tea. I will now try switching to almond or rice milk; fortunately the first of these is among the speciality milks that can be delivered by our milkman. Glad it was useful Kath. 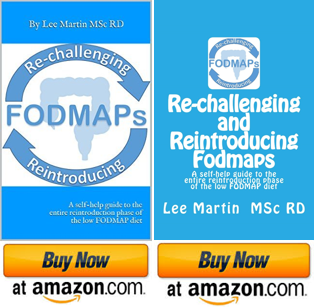 Make sure you complete the reintroduction phase of the low FODMAP diet so you can work out your tolerance levels to the different FODMAPs. You might find you can actually have some lactose in milk or indeed that GOS in soya does not trigger any symptoms. Best of luck. Thanks and can you now please help clear up some new confusion for me? After switching to almond milk I remembered that almonds are among the group of nuts that should only be eaten very sparingly by people following a low FODMAP diet. Is the milk ok or not? There is such a small percentage of almonds in the milk that when it has been analysed for its FODMAP content it was very low. Hi there, at the moment I use Koko Coconut milk as my alternative milk, do you know if this is high fodmap? Thanks. I can’t remember if KoKo Coconut milk was tested specifically but when a range of coconut milks from the UK have been analysed for their FODMAP content >125mls is moderate in the FODMAPs GOS & fructans while 250mls is high in these FODMAPs.